Approximately 10% of children struggle with a communication disorder. Children who receive speech-language therapy prior to the age of 5 years old have a much higher rate of success than those who begin intervention later. At Beth Ingram Therapy Services, our goal is to identify any difficulties your child might have with his or her speech-language development and provide comprehensive speech therapy to help your child overcome these obstacles. Your child may need a speech-language screening if you have concerns regarding any of the above, or if your child is not meeting age-based speech and language developmental milestones. Download our screening brochure. The screening will take place at your child's daycare, preschool, or elementary school. Please ask your school's director to contact us to set up a screening at your school. An evaluation is a comprehensive assessment using standardized testing measures, informal assessments, observations, and parent/caregiver reports to address your child's speech, language, and/or feeding/swallowing skills, depending on your concerns. 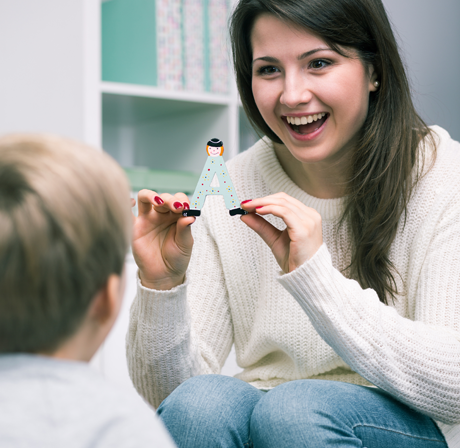 A speech evaluation is the assessment of your child's functioning with age-appropriate articulation skills, phonological disorders, fluency/stuttering, voice skills, and oral motor functioning. A language evaluation is the assessment of your child's understanding and usage of age-appropriate vocabulary and concepts, ability to follow directions, formation of sentences, usage of grammar structures, and social language skills. Reading and spelling skills, as well as auditory processing skills, may be assessed. A feeding evaluation is the assessment of your child's feeding and swallowing skills conducted through an interview process, an assessment of their oral motor structures, and an observation of feeding to determine their current skill and need for interventions. Call our office to schedule an appointment. We take many insurances and offer private-pay options. You may need a referral from your primary care physician/pediatrician for us to be able to complete your child's evaluation. Bilingual evaluations in Spanish and English are available upon request. It takes approximately one hour to complete a speech-language evaluation or feeding evaluation. The therapist will conduct a comprehensive assessment to determine your child's current level of functioning. At the end of the evaluation, your child’s therapist will review the results with you and discuss treatment recommendations. Our pediatric speech-language staff will write up the evaluation and submit it to your insurance company for authorization, as well as mail or email a copy of it to you directly. Once we obtain authorization from your insurance plan, one of our speech-language staff will contact you to schedule your child’s first appointment. We encourage you to download and complete new patient forms prior to your initial therapy session. At Beth Ingram Therapy Services, our pediatric speech therapy services are provided by a speech-language pathologist who is licensed and certified in the state of Florida with a master’s degree in communication disorders. Our therapists use the latest cutting-edge pediatric speech therapy techniques. Each therapist keeps abreast of current treatment techniques through a variety of continuing education courses in speech therapy for children. Pediatric speech therapy sessions are designed around an individualized plan of care to address your child's specific needs and provide them with the greatest quality of life. We offer both individual and group therapy sessions. The number and frequency of sessions is based on the recommendations of the therapist who conducted your child's evaluation. Therapy can be conducted in one of our Tampa-area clinics or at your child's daycare, preschool, or elementary school (location may be determined based on your insurance and therapist availability). If you are a parent, doctor, or educator with a child that needs pediatric speech-language therapy services, turn to the professionals at Beth Ingram Therapy Services in the greater Tampa Bay area. Call (813) 653-1149 or request an appointment online.